In addition to its artichokes, Aranjuez is also known for their tender asparagus and sweet strawberries—all of which are just now coming into season. I was particularly interested in the strawberries here which are smaller and more flavorful than what we get in California. They actually look more like wild strawberries or what the French call fraises du bois. Actually, I think they are closer to Gariguette strawberries which are similar to wild strawberries but slightly bigger (and, I think, more flavorful). Wash and hull the strawberries. Chop all the ingredients finely and press through a chinois or fine mesh sieve. 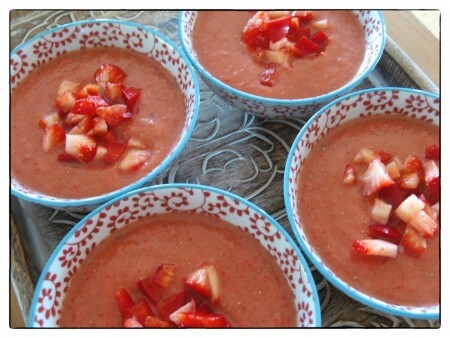 Chill for at least an hour and decorate with chunks of strawberry wedges or pearls of watermelon.